The Catalan tenor presents a studio recording entirely devoted to the beautiful songs of his great Catalan-Spanish compatriot Federico Mompou (1893-1987). Though Mompou�s fame rests largely on his solo piano works, his many songs comprise the other genre for which he is recognised as a twentieth-century master. 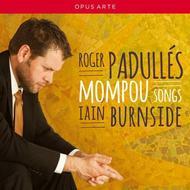 Roger Padull�s is accompanied by the noted accompanist Iain Burnside.